New siding replacement is a major home improvement project that carries significance in both the appearance and preservation of your home. New siding is different from a fresh paint job or a decorating scheme that you can change easily because replacement is labor intensive and the durable material lasts for many years. Many considerations are needed when you replace your existing siding such as color, material, financial concerns, as well as climate. The following information will provide you with an outline of the important decisions you will face before replacing your home’s siding. Warped siding boards usually indicate a problem. Use a screwdriver or awe to poke the surface area and beneath the siding to determine the condition of the material and substrate. If the siding material or substrate feels soft or cracks easily, it is a sure sign that it’s time to replace the siding. Mold or mildew growth on interior walls adjacent to exterior walls could be an indication of excess moisture seeping in through compromised siding. In addition, peeling paint, sagging wallpaper, and soft or crumbling drywall could also point to a moisture problem resulting from compromised exterior siding. Homes with wood siding often fall victim to dry rot. Lightly tap on the areas of your siding that you suspect of having dry rot. This will allow you to identify a dry rotted area as only the outer layer of siding will remain intact. The colors and textures you choose for your new siding requires careful thought and consideration. Vinyl siding is manufactured in a wide range of colors while both wood and fiber cement board often require paint or stain. One of the most important considerations to take into account when choosing a siding color is how your house will blend with the other houses in the neighborhood. While you may be attracted to a bright pink house, it might put a damper on your property values if it does not blend with the context of your neighborhood’s color palette. It would be beneficial to first check with your HOA before choosing a siding color. Homes under the protective umbrella of a homeowner’s association often have rules and restrictions limiting your color choices and siding materials. Climate considerations are also important regarding siding color. Homes located in hot climates would benefit from lighter siding colors as they are resistant to heat absorption. 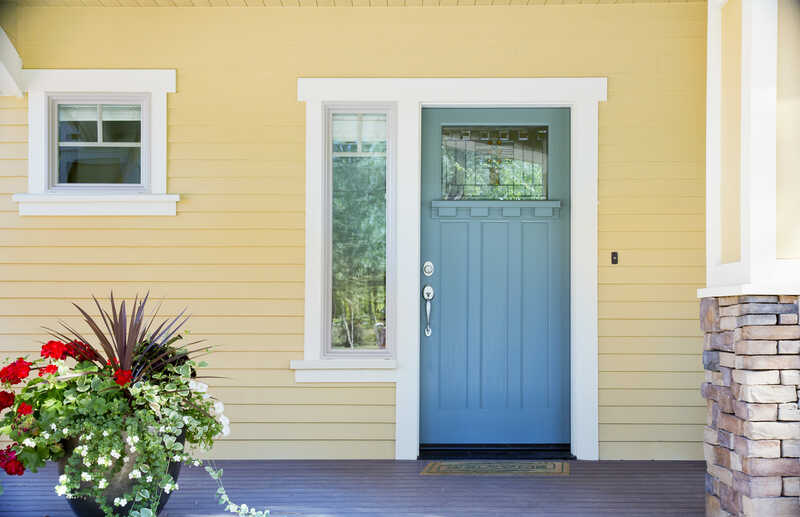 Take into account door and window frame colors and how they will blend with your new siding color. In addition, if you plan to update them or other exterior features of your home in the future, you must consider those when choosing a siding color as well. The type of siding material will have a profound effect on the color you choose. Although wood siding requires periodic painting for protection, it allows you the opportunity to change your color scheme. Manufacturers produce vinyl siding in a wide range of colors. Although you can paint vinyl siding, you will lose its factory finish and maintenance-free properties. One of the most important decisions regarding siding replacement is the type of material you choose for your project. Several options are available that require careful consideration and will depend on maintenance requirements, climate, and how the siding blends with existing homes in your neighborhood. The most common siding types used in residential construction are wood, vinyl, and fiber cement board. Maintenance and upkeep are important when choosing a siding material. Vinyl siding requires the least amount of upkeep with just periodic washing. Wood on the other hand will require the most upkeep to keep it properly sealed and protected from the weather. Fiber cement siding is considered middle of the road, requiring light washing and periodic painting mostly for aesthetics. Climate should weigh heavily on your siding choice. You must consider heat, humidity, rainfall, and insulating factors before choosing a siding type. Cold weather homeowners might consider insulated siding to increase their home’s energy efficiency. Evaluate the siding types used in your neighborhood. To maintain or increase property values you should choose a type of siding that is common throughout your neighborhood. In closing, financial concerns for large home improvement projects such as siding replacement always come first. It is important to note, that the type of siding you choose could have a positive or negative impact on your home’s property value. Review your options with a siding contractor. Their knowledge and experience in the industry will allow them to evaluate and recommend the best siding replacement material for your home based on the aforementioned considerations above and your budget.